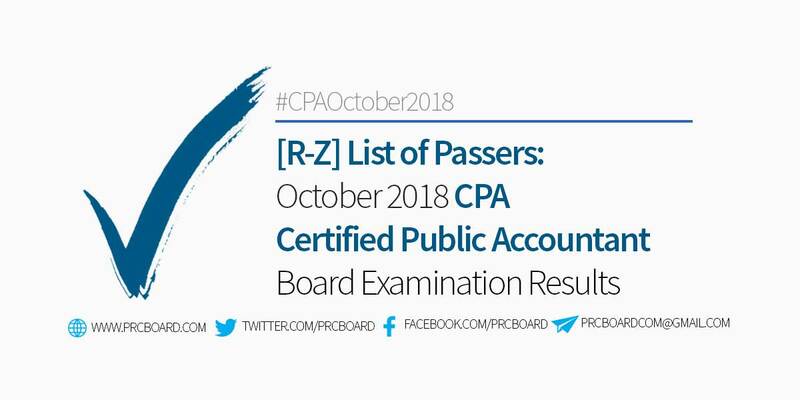 MANILA, Philippines - The official results, list of passers, top examinees, performance of schools and other important announcements for October 2018 Accountancy, CPA board exams are released by the Professional Regulation Commission (PRC) six (6) working days after the board exams. Below is the list of passers for October 2018 Certified Public Accountant Licensure Exam (CPALE) with surnames starting with letters R-Z. 3:13 pm. Waiting prin kme sa result. what time po ba talaga ang results? naiiyak na po friend ko. mga what time kaya? baka naman po pwd na pong ipost ng mas maaga sa 7pm....kabang kaba na po kami. I have been checking for the result and wala pa hanggang ngayon po. I have not slept well thinking about the result. Could you please release the result ASAP to get throught with this feeling, whether pass or not? please please please! As per PRC, the target date is tonight at 7pm. But according to the BOA Chairman, if not tonight, results are expected to be released tomorrow (madaling araw). Waa yan na huhuhu thank you Lord! Ano na??? Yung released shortly ilang oras na a! Kinuha na ata ng vendetta yung results.